You’re one step away from having the ultimate experience at Playhouse Nightclub. Welcome to Playhouse Hollywood. Great for any occasion or a simple night out on the town; Playhouse VIP service is second to none. With top DJ talent, big name celebrity parties and live shows, state-of-the-art lighting and Funktion-One sound for a fully immersive experience, it is safe to assume that your night will be in capable hands and, moreover, a great one. If you are looking for big, out-of-control fun; PLAYHOUSE is definitely the house you want to play in. Whether it’s a bachelorette party, birthday or simply a night out with friends; count on expert recommendations and superior VIP service to guide you through the party planning process. Check out our party packages for further information. Or to make a reservation, give us a call at 323.656.4600 and one of our Playhouse VIP party pros will contact you as soon as possible. Cut the velvet rope and let our staff truly make you feel like a VIP. Reserve your section today. Be part of the limelight. Indulge in a playful night of revelry with Playhouse bottle service. Great for any occasion or a simple night out on the Tinseltown. As a bottle service guest, enjoy fast-track entry & preferred seating reserved exclusively for you throughout the duration of your evening at Playhouse. There are many of occasions that call for a little more than a regular old night on the town. 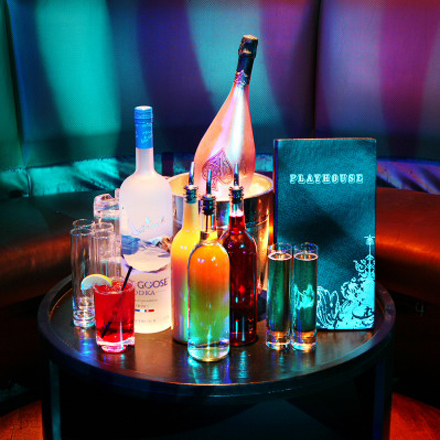 If you are looking to do it right, and party in style, Playhouse bottle service should be at the top of your list. Book a table here now and skip the lines straight into the party; or contact a Playhouse VIP host directly: Quick & Easy! Call Now: 323.656.4600. Easiest way to get setup on the Playhouse Hollywood Nightclub Guest List is to complete the form below. Once you submit form, we’ll send you a confirmation email with your requested schedule & specific details. 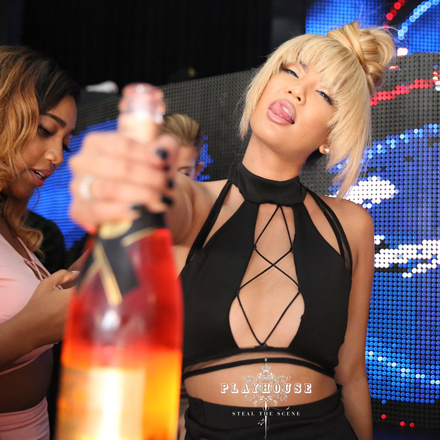 Playhouse is renowned for throwing some of the most impressive parties in LA. So who better to set up your Birthday than us? If you are looking to plan a birthday party after dark in LA; then why not sit back and let us do what we do best – throw an extraordinary party to make this birthday the best ever! Everyone deserves to be spoiled at least once a year; especially if it’s your birthday. And your big night deserves a significant celebration. Please complete our (“Make Your Request”) form to inquire about availability and pricing. A member of our Playhouse Concierge will contact you to finalize your reservation. 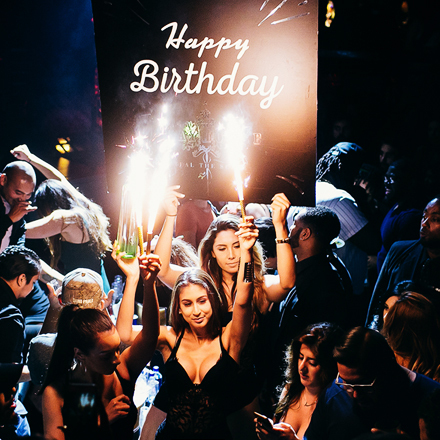 *Playhouse Birthday bottle service packages include COMPLIMENTARY bottle of Playhouse Rosé Champagne plus customizable birthday show (“Bottle Presentation”) available upon request at birthdays@playhousenightclub.com. Are you a soon to be bride or friend to one? Lining up plans for a final fling before the ring? From classy to sassy, a Playhouse Bachelorette party makes any bride-to-be’s last night of singledom an unforgettable one. Most of all we wish you a wonderful time, and congratulate you on going from a “Miss to a Mrs.”. We look forward to helping you plan a fun bachelor night out at PLAYHOUSE featuring A-list talent nightly. Please complete our (“Make Your Request”) form and and a Playhouse staff member will contact you as soon as possible. For a quick response, Phone: 323.656.4600 | E-mail: info@playhousenightclub.com. Make your bachelor party legendary by going BIG in LA with Playhouse VIP. Planning a Hollywood bachelor party can be a daunting task. We’re guys for crying out loud. We do not anticipate parties. Rather, we show up and drink the beer. PLAYHOUSE is here to provide that service. Your Next Event Happens at PLAYHOUSE. As an industry icon since 2009, Playhouse has established itself as one of the hottest night spots in Los Angeles. Our 10,500 square foot versatile venue allows for groups of 15 to 750; and can be transformed to accommodate corporate events, private parties or lavish cocktail receptions. From budgeting and concept design to execution and on-site management, our Playhouse in-house party pros can assist with all aspects of your planning. We specialize in creating one-of-a-kind experiences for our clients. Our full-service production department will work with you every step of the way to achieve all your event goals. Whether it’s creating the perfect menu, booking top notch entertainment, red carpet services or interactive corporate branding, we have the expertise to make your event a success. You tell us your vision; we make it happen! Looking for a place to host your holiday party or special event? Look no further. With over 10,500 square feet of extraordinary design and extravagant décor as well as a state of the art sound and lighting, PLAYHOUSE promises an exciting and over-the-top holiday party experience for the discerning nightlife enthusiast. Please complete our (“Make Your Request”) form to inquire about availability and pricing. A member of our Playhouse Concierge will contact you to finalize your reservation. For a quick response, Phone: 323.656.4600 | E-mail: info@playhousenightclub.com. 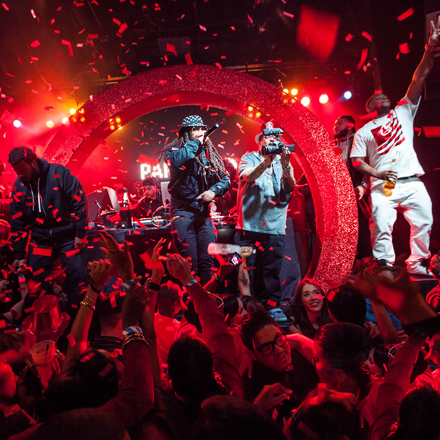 Since its debut in July 2009, PLAYHOUSE has become THE nightlife destination in LA. Located in the historic Fox Theater Building, he 10,500 square foot venue is more than just an average club. While most nightclubs focus on the DJ and the promoter, Playhouse concentrates on the lighting, the sound and, most importantly, the production – which truly makes each and every party significant. After nine years, Playhouse continues to reach capacity nightly. Sleek and hyper modern, the interior is young, energetic and decadent. 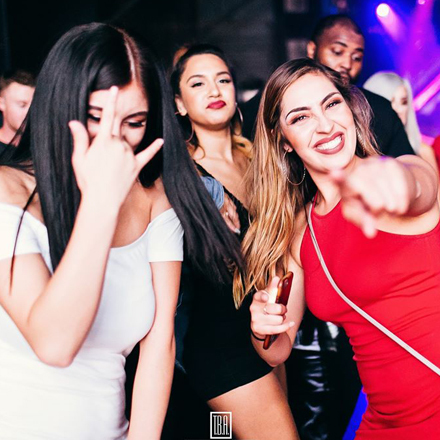 Playhouse Nightclub is the kind of place you might stumble across various Jenners, Diddy, or Drake on your way past the velvet rope. Past live performances have included Cardi B, Diddy, Lil Wayne, Drake, 50 Cent, Chris Brown, Fetty Wap, will.i.am & apl.de.ap of The Black Eyed Peas, Kid Cudi, Lil Jon, Jermaine Dupri, LMFAO, Jason Derulo, Trey Songz, Billy Idol and many more. Playhouse showcases some of the most talented DJs and artists in the music industry. Tiesto, Chuckie, Sebastian Ingrosso (Swedish House Mafia), Alesso, Pete Tong, Dada Life, Dirty South, Afrojack, Bingo Players, Sander Van Doorn, Manufactured Superstars, Nicky Romero, Robbie Rivera, Dubfire & Sharam (Deep Dish), Sunnery James & Ryan Marciano, EDX, Mark Knight and Cedric Gervais have all graced the decks. 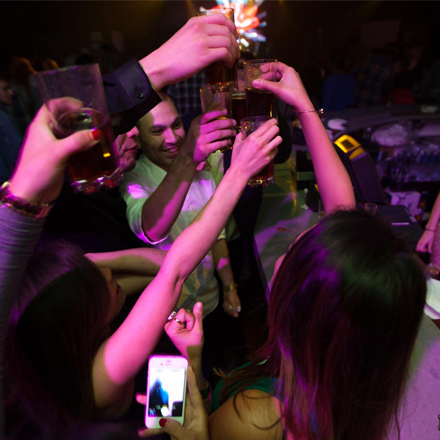 For those of you that prefer revelry spiked with risk, we invite you to Playhouse Nightclub. 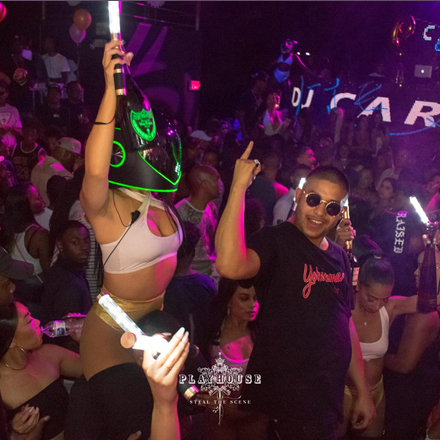 © 2019 Playhouse Nightclub | Design by JBP | All Rights Reserved.